Why does PPFE need to be checked? Personal Fall Protection Equipment (PFPE) must be checked by an expert (in accordance with DGUV 112-198) at least once a year and after being put under any stress or if you have any doubts as to its working order. The expert will decide whether the equipment is in good working order and whether it has reached a level of maturity defined by professional regulations. The material inspection is based on the principles governed in Germany by German statutory accident insurance (DGUV statutes 312-906) and on the relevant manufacturer specifications. The legibility of the product labelling should also be checked. The inspection should be carried out according to the manufacturer's specifications and must be documented. The service life of Personal Fall Protection Equipment (PPFE) depends to a large extent on the conditions of use. Harnesses and ropes made of chemical fibres are subject to a certain ageing effect even if not put under any stress, e.g. from ultraviolet light or from climatic or other environmental influences. In addition, the softening agents in textile materials used in PPFE can volatilize over time, which can lead to the equipment becoming brittle even when it is not being used. This can cause damage to the material, which may not be visible, and loss of resistance. The DGUV 112-198 statutes therefore recommend that ropes and cables are replaced every 4-6 years and harnesses every 6-8 years, although the manufacturer's instructions in the user handbook should also be observed in this respect. Almost all products that are used very intensively will not reach their maximum service life. Due to the fact that SKYLOTEC products are made of the highest quality materials, under normal usage conditions a maximum service life that exceeds the recommendations of the DGUV 112-198 regulation can be assumed. As required by the new PPE regulation, SKYLOTEC products will be labelled with a new maximum service life. Changes to instructions for use and labels as well as the adaptation of our asset management database HOMEBASE are scheduled but will take some time to implement. The changes will, however, be completed by the time the PPE regulation comes into force on 21/04/2019. However, we have already increased the maximum service life for our current products, even if the documentation has not yet been revised. All SKYLOTEC products produced from January 2018 onwards can be used for a maximum of 10 years. In the event of any conflicting information appearing in instruction manuals or HOMEBASE, for example, this letter will serve as confirmation. An overview of the maximum service life per product group can be found here. As a manufacturer, SKYLOTEC is authorised to inspect ropes, cables and harnesses from all manufacturers and to approve these products for further use by recording this in service logbooks. 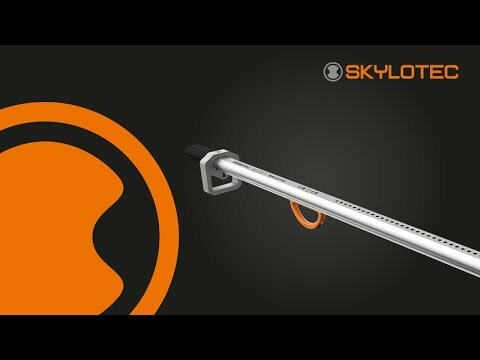 SKYLOTEC also carries out inspections of all the abseiling and rescue equipment it manufactures or sells itself. SKYLOTEC carries out inspections in-house or on site at your own premises.